Occasionally entertaining, but plagued by AI bugs and hamstrung by a clunky user interface. Less than the sum of its parts. Imagine a jigsaw puzzle of something great – say, an anthropomorphic Lamborghini bench-pressing a dinosaur. Now imagine the pieces are all the wrong shape and will never fit together. You can still make out part of the Lamborghini's flexing bicep and the dinosaur's worried expression, but it's not what it should be. That puzzle is Cortex Command, a 2D action game with bits of squad strategy and base building, none of which quite fit together. It casts you as a brain-in-a-jar that calls down troops, tools, and guns from space to eliminate other enemy brains-in-jars. Gold pays for all this and can be harvested from the ground, meaning it's wise to have a few cheap units dutifully digging away to feed your war machine. This is where the UI and AI start messing everything up. You're limited to direct control of one unit at a time, so you have to rely on the AI's help, but your commands work sporadically at best. Robots ordered to mine for gold will do so until they decide not to. Pathfinding and movement AI seem to barely function. The targeting, however, is excellent, so even if your opponent is tripping over his own legs into a QWOP-inspired heap, he can still shoot your head off. During my first mission I assembled a diverse squad and planned a tactical strike on the enemy bunker. Alpha squadron would push back the enemy so that Donald, the explosives expert, could blow a hole in the roof. By the time I reached the enemy, half my troops had dropped their weapons or lost a limb, two had killed themselves with their jetpacks, and Donald had dug a hole to the bottom of the map. Well done, Alpha squadron. I tried some of the AI mods and found them helpful but not revelatory. 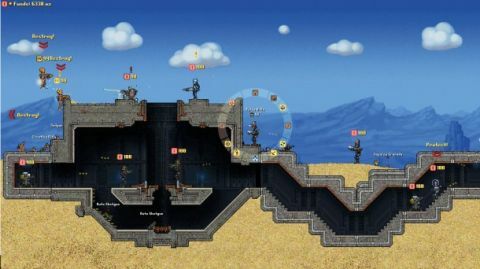 Cortex Command features a campaign mode and standalone scenarios. Of the two, the scenarios are generally more structured, and break the game into manageable chunks. I had the most fun with the Dummy Assault scenario, where I sent wave after wave of dead men into a robot controlled bunker. Campaign mode is barely explained, though it tries to stitch the combat into a turn-based conquest mechanic where you capture points across the world. The metagame doesn't make a difference when even the most basic missions are arduous, requiring the perfect combination of patience, skill and luck. Multiplayer is limited to local split-screen only, though attempting to play a game this spotty competitively could only end in tears. Co-op fairs a bit better if you're playing on a TV – gathering four friends around a computer monitor seems unlikely. Cortex Command is a long way from being a game that people are going to feel comfortable paying £12 for. It looks neat, the basic gun combat is fun, and the destructible terrain works well, but the pieces don't fit together, and the failed AI makes it a drag to play.